Stop weeds before they start! Early spring application, prevents crabgrass and problem weeds all season long. Apply in late fall to to protect your lawn during the winter. Use on lawn in early spring or fall. Not for use on dichondra and bentgrass lawns. Apply in Spring to prevent crabgrass all season long. Fall application prevents winter weeds such as Poa Annua, henbit and chickweed. Don't apply more frequently than twice a year. Allow at least a two month interval between applications. 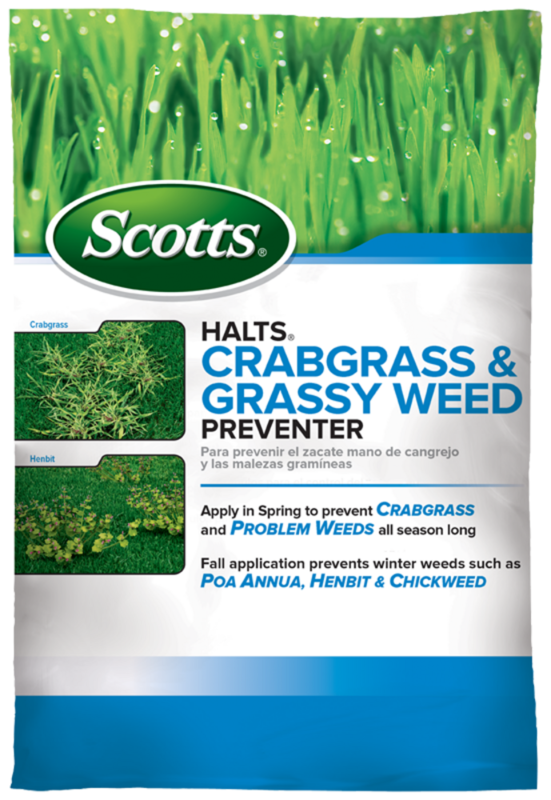 Apply in early spring to stop crab grass and problem weeds before they start. Fall application prevents winter weeds like poa, annua and chickweed. Rain, snow, or freezing weather will not affect performance. Don't use on newly seeded grass lawns until after the fourth mowing. On newly sprigged areas, wait five months before application. Don't plant grass seed for four growing months or sprig an area for five months after use of this product. Don't rake or aerify after application, as the Halts(R) chemical barrier in the soil will be disturbed. Nonrefillable container. If empty: Do not reuse or refill this container. Place in trash or offer for recycling if available. If partly filled: Call your local solid waste agency for disposal instructions. Never place unused product down any indoor or outdoor drain.